We’ve all seen our fair share of optical illusions, from the warped triangle to images where we see flashing dots. However, some optical illusions are more subtle and thought provoking. 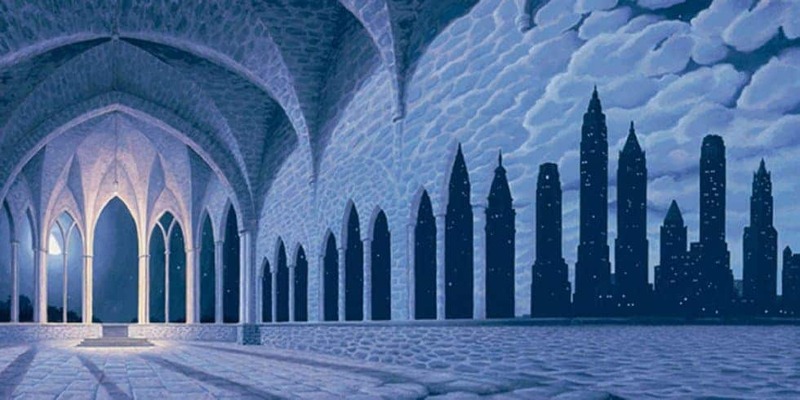 Rob Gonsalves is an artist who is known for his optical illusions, albeit using a different medium. 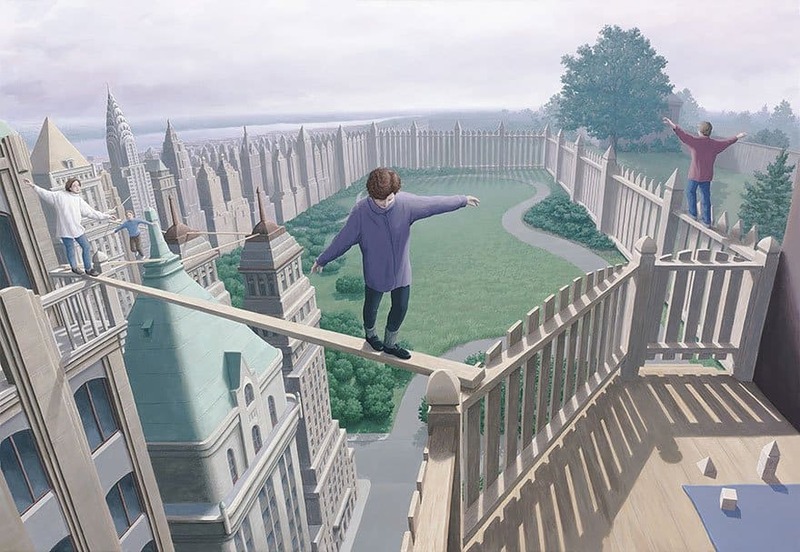 Rather than images which have been created on computers, Gonsalves paints optical illusions. 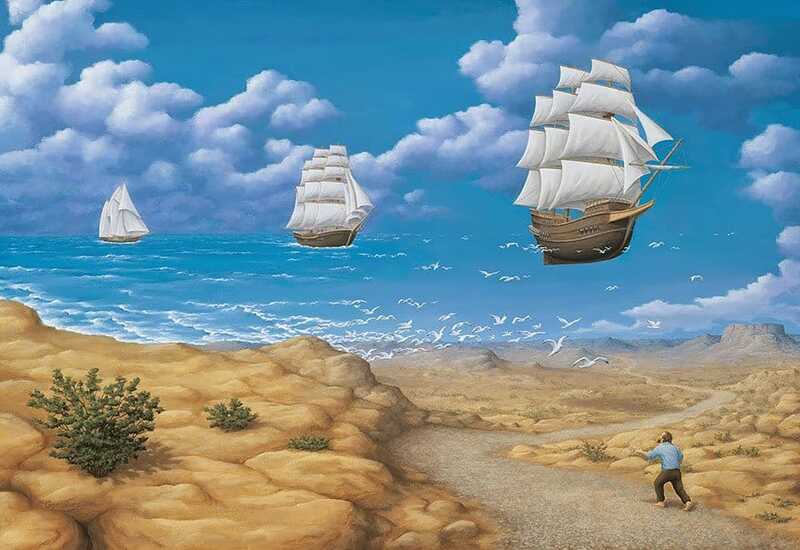 Gonsalves seems to have taken inspiration from sailing boats, as they appear in many of his paintings. Check out these eleven mind blowing optical illusions. Towards The Horizon shows a car driving across a bridge seemingly into the horizon. As the bridge merges with the horizon, the sailing boats to the right become the arches, blending with the surrounding water. Beyond The Reef shows two individuals who are seemingly flying and swimming simultaneously. Depending which aspect of the of the image you’re looking at, the perspective shifts. 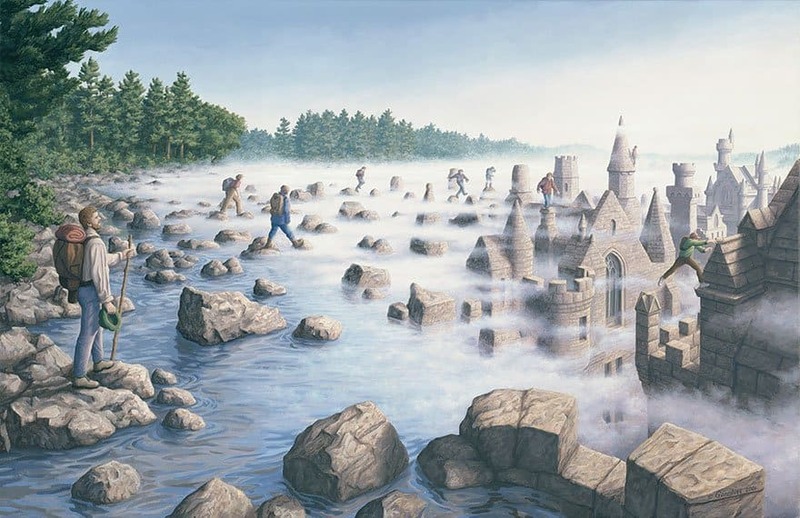 Stepping Stones is one of the more dramatic images created by Gonsalves. Showing several hikers crossing a river towards the ruins of an abandoned city covered with fog. As the hikers cross the river via stepping stones, they move from stone to rooftop. 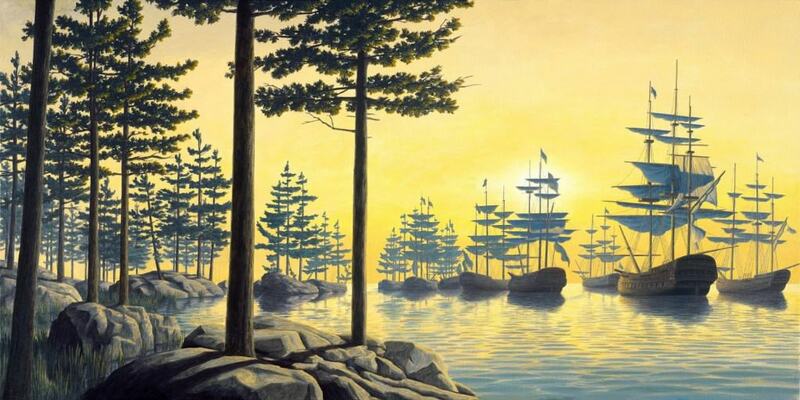 What first looks like a sunset behind tall pine trees spread across the horizon, you’ll notice that the small islands towards the right of the painting are actually sailing boats. A copy of Sailing Islands backed on aluminium would set you back over $2,000. On The High Seas shows a father, son and daughter flying kites on a beach. Progressing from left to right, the family age, with their kites merging into a final shape; a sailing boat. 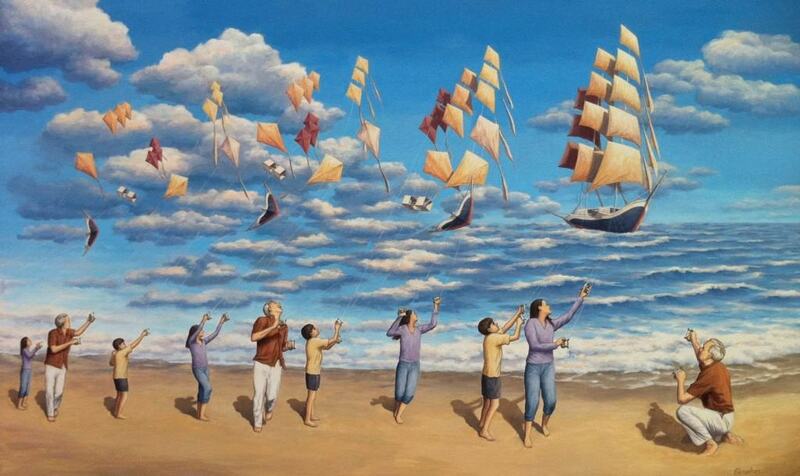 As can be seen with the previous optical illusions, Rob Gonsalves seems to gain inspiration from sailing boats, incorporating them into plenty of his works. What first appears as a garden with children walking along the fence, High Park Pickets depicts the merging of city and home life. The male in the red shirt, balancing on the fence has only a short fall, which would be cushioned by the soft grass. The female walking along the plank between the balcony and fence has a much greater fall. This may relate to the safety aspects of city life as compared to home life. All-in-all, it’s a clever painting. Cathedral of Commerce is one of Gonsalves more popular and most recognized pieces. The high-ceilinged cathedral is lined with arches, which, as you move across the painting, transform into the skyline of a bustling metropolis, with the stonework on the walls becoming the clouded skyline. 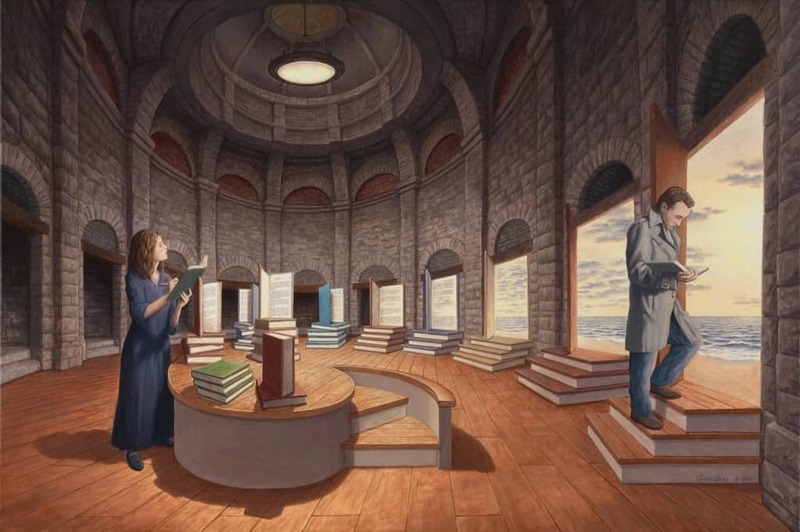 Space Between The Words is a powerful work of art from Gonsalves, depicting a library-type room lined with doorways. As the doorways move further into the image, they transform into open books, with the lining of clouds appearing as though they are blocks of text. The stairs also appear to be created from books. 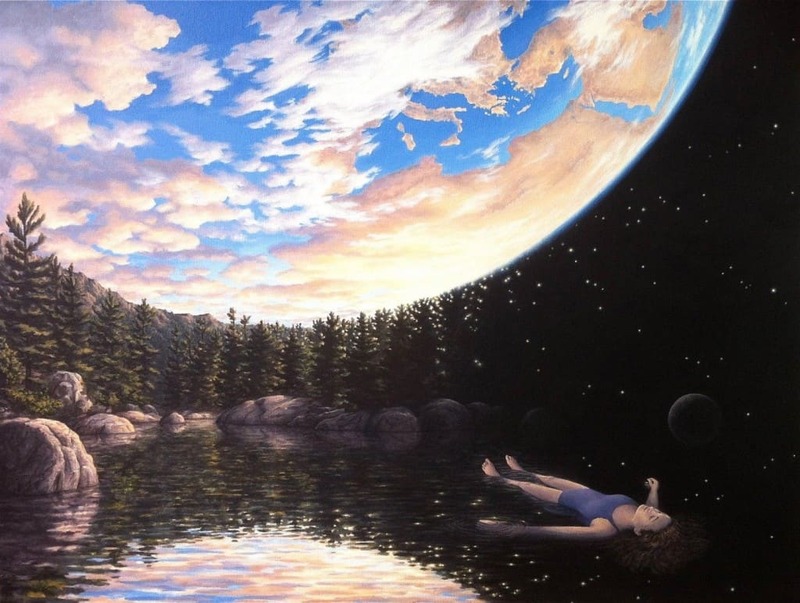 This artwork shows that to grasp reality, you must look deeper than the surface. The Phenomenon of Floating is an artwork which incorporates three main elements. These being the girl floating on the water, the ‘sky’ above her and the starry night to her right. Through the way the sky above, the treeline and the night sky combine, it appears as if the girl is floating in water outer-space with a spectacular of the earth. The Sun Sets Sail was created before Towards The Horizon. 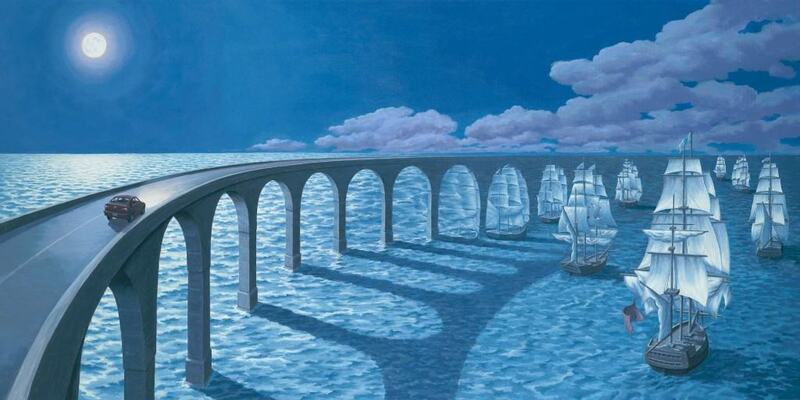 However it follows the same concept, with the sailing boats being the arches in the bridge. The use of the blue sky and the cloud cover in this painting produce the bridge. This particular painting, Sailing The Seas And Sky, shows two sailing boats on the ocean. The third sailing boat, which is surrounded by white birds, gives the impression that the birds are acting as the whitewash of the boat. A clever optical illusion of the boat floating in the air.